Our team recently received a call from a retail store in need of parking lot paving in Roseland. The owner informed us that he was in the process of opening a new location. 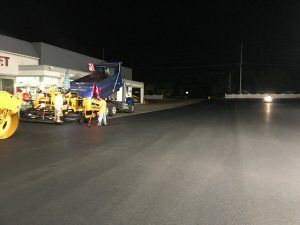 While the store was coming along nicely, he had decided that he also needed an asphalt contractor to redo the parking lot. We met the store owner at his new location later that week to provide him with an estimate for the job. After a thorough inspection of the project, we delivered a detailed estimate, outlining the costs for the entire parking lot paving project, and the projected schedule. He was extremely impressed with the initial work that we performed, and we agreed to start work the following week. As we began work we knew exactly the necessary steps to take in order to provide the best-finished product for our customer. We prepared the site by grading it, creating a level surface for the base layer of asphalt to rest on. This creates an immensely strong foundation for the asphalt and helps to avoid future problems. We followed that with our hot mix. Our final steps were inspecting the entire lot and mark it effectively for customer’s use. After we had completed the job, we checked back with the business owner and were pleased to see how satisfied he was with our work. We left the job with a sense of pride knowing that our first-class work helped South Shore Paving remain a top paving contractor in Roseland.